Relax… if you text, your head won’t fall off & you won’t damage your spine! You can’t have missed it – headlines in newspapers, all over the internet here and here. The headlines are enough to make anyone just a bit worried – but do we need to, really? Let’s begin with some anatomy and physiology. Necks and heads are supported by a wonderful array of ligaments and tendons (you know those tough fibrous bands you usually want to cut out of that piece of steak? ), loads of muscles developed for strength, flexbility and subtle adjustment, and plenty of blood supply. The skull, although weighing about 5 1/2 kg, is supported by these muscles (and yes, there are a lot of them! ), as well as balanced on strong but interlocking vertebrae. The thing is, that even though you’ll have seen the calculations, these are quite misleading. For one thing, the biomechanical equations used in these calculations are often based on a single point about which the head/neck rotate – and this just isn’t the case. You can see that there are seven or more vertebrae involved in the movement, meaning the weight of your skull is distributed along each one of them – as well as that, if you take a look at the illustration above on the left, you’ll see two things: one is the strong and inelastic attachment (in white/grey) along the base of the skull and the vertebrae, and the second is just how long that trapezius muscle is. If you know much about physics, you’ll know that when there’s a long and strong anchor to an upright, it can withstand far greater forces than if it’s a short upright without any anchor. So, the weight of your skull is cantilevered (almost) forward with this muscle (and that criss-cross set of muscles you can see in the cutaway section of the image on the left above) and guess what? It’s designed so you can look forward, to the left, to the right, look up – and yes, look down. What’s even more important to know is that calculations based on this weird equation don’t factor in living, adaptive tissue and the effects of goals, attention, beliefs and your fabulously adaptive nervous system. This range of movement is really important: it’s so that our forward facing eyes can see all that’s needed to be seen. And most importantly, given that humans are tool-users, our necks allow our heads to bend forwards so we can see our hands as we use tools. So, when we look down at things for ages, what’s the pain about ? Well, the first thing is that feeling sore in the muscles around the neck is common – not only do those muscles support our head and neck, they’re also responsible for lifting and moving our shoulders. And if you hold any muscle in one position for long enough it will probably be uncomfortable. This discomfort is great! I’m not kidding, it’s a good thing to feel uncomfortable not because you’re doing any damage to the area, but because it means you’ll move. So we often sit with shoulders elevated, perhaps while writing, holding something, and most often, being tense or stressed. It’s a protective position we can get into because it makes us look a bit smaller and less threatening (blame that on our ancestors). The second thing is that feeling sore doesn’t mean you’re doing any damage – pain in this instance is all about giving you an alert that it could be worth moving, provided your current goal isn’t more important than doing so. What are the long-term problems with looking down a lot? Well, this is where the research gets a bit murky. Perhaps, over time, the muscles that are usually elongated but have to work hard to support your head and neck, get used to being in that position. Perhaps the bones (vertebrae) start to reshape to conform to that position. Perhaps we feel more uncomfortable when looking up, or straight ahead even, so we avoid it. The truth is, the research literature isn’t very clear at all – and in the absence of clear evidence that looking down is bad (and I mean looking down all the time) I think we can relax a bit. The cure for getting comfortable again? You’ve probably all done it yourselves – shrugged your shoulders, looked around (up, down, left, right), stretched your arms up and out, and perhaps – OMG – gone for a walk. Todd Hargrove also writes very clearly about pain and posture – this time about back pain (but include neck and shoulder pain too). Tony Ingram has over 100 articles on pain science, so take a look at them too. You might be asking why on earth am I writing about text neck when so many others have written clearly about it before. Well, over the last week I was attending an occupational therapy conference where I was astonished to find clinicians and educators warning us about the health effects of too much screen time. Text neck was mentioned. Add to this, a recent occupational therapy newsletter featured an article by a physiotherapist arguing that we need to protect our necks from the ills of text neck. I don’t want to diss the person who said it, or the person who wrote that article, but I do think it’s critical to point out that the basis for this information is outdated pain science. It’s unnecessary scaremongering, it creates fear and concern about normal aches and pains that we all experience, it can begin a process of “medicalising” (or perhaps “pathologising” is a better word) experiences that we can self manage very easily. We simply need to know that moving is good, holding any constrained posture (even so-called “good posture”) gets uncomfortable after a while, and that it’s OK to feel pain and then do something about it. It does not mean an injury or long-term pathology has been uncovered. Why no references? Well, the three sites I’ve posted have summarised the research very well, so I figure it’s best to go read what they’ve written rather than rehash a lot of literature that I’m not especially familiar with (I like to deal with people rather than muscles and bones and nerves). ← How good is the TSK as a measure of “kinesiophobia”? Whereas I cannot agree more with your “common sense” approach to this, it is probably worthwhile to add that it sometimes depends on the context (as usual). There are definite ergonomic risks to poor, awkward and sustained postures, well documented and researched, and yes, technology companies consider their product’s performance and not the human ergonomics behind it. So, forward flexion of the neck in dentistry is a significant problem! and perhaps certain types of work behind computers, but yes, in most occupations, you should be able to remedy it by the approaches you mentioned above – get up and move and stretch! Fortunately most of these “syndromes” are fashionable and go through stages. I remember a time that “blackberry thumb” was considered the new modern dilemma. Perhaps before this television’s “square eyes”? Can you give me some of the references you refer to? From my reading of the research there are no risks of injury from these positions, although experiencing pain/discomfort is common. I’m differentiating between feeling uncomfortable and having tissue damage because while one is managed simply by changing position, tissue damage may require a different approach. It’s just that tissue damage is rare and usually accompanied by force as well as awkward positions and repetitive movements (eg tendonosis/tendonitis when using pruning shears at first). I can’t think of any movements you’d need to do with your neck that might have all three of those components. cheers! Within dentistry, most definitely with high incidence of spondylolitis, listhesis and soft tissue+. Its linked to the constant awkward postures, often cervical flexion, rotation and sometimes lat flexion too. Just google, theres a host of information on the topic and I see it frequently in practice. 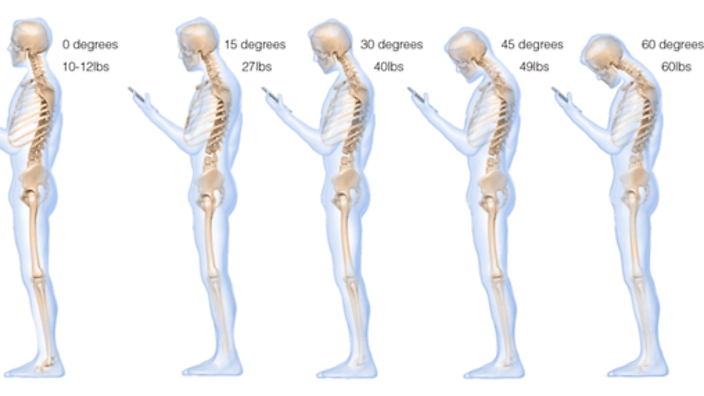 Great call to moderation on text neck. We had book worms. I don’t remember book worms neck bit maybe we had it. We do love a good fad name. And the medical community isn’t not immune to fads and can even starts them. Having said that, we need to encourage people to move globally and locally in lots of different ways. Years of limited motion or habitual use does change is. Let’s make it for the better! This is great! I was cleaning out my blogroll, a nasty job, and somehow landed here. This will make a great addition to the medical professionals category. Keep on blogging. Bronnie, as always, your posts are on point and filled with factual information. Thank you for being such a valuable voice in this industry!